Located across from Allen’s Drive, the stand was owned by Jimmie Linhart, 16 in 1947. His parens were Mr. and Mrs. J.C. Linhart of Mt. Lebanon, Pa. 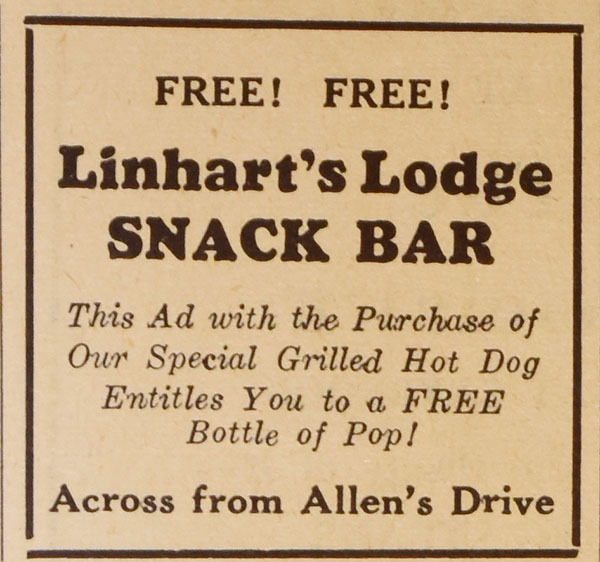 They purchased “the (Linhart) lodge” in 1946 from Bertha Koerner. He had a sister, Nancy, who was 9 in 1947. Jimmie offered a free bottle of pop to every customer who purchased one of his grilled hot dogs with the works.